How about starting off the week right with a GIVEAWAY!?!! I'm so excited for you all! 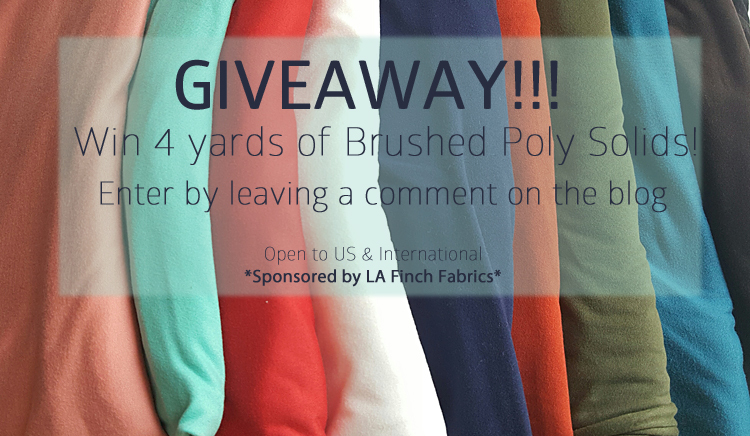 Josie at Finch Fabrics has generously offered 4 yards of Brushed Poly Solids, in your choice of colors, to one lucky reader! Entering could not be easier! Just leave a comment on this post, telling me which color is your favorite! The giveaway is open to US and international readers as well. How awesome is that!? You have until Tuesday, 11:59pm EST to enter. To see what I made with this awesome fabric, check out this post. Can't wait to hear what you all would make! EDIT: The winner is REBECCA, who said: I'm normally a blues and green type person, but there's something about that shade of red that I really love. Congrats! I'm a Teal girl but the Mustard ist just too beautiful to resist! And thank you so much for the giveaway! That Teal is absolutely beautiful. I can see myself wearing something made out of that! Ooh, spoiled for choice! I find myself torn between the navy and the burnt orange. I'm normally a blues and green type person, but there's something about that shade of red that I really love. The muted coral and the aqua are just lovely! Thanks for the giveaway! Oh the Wine color is just right. Thank don't for the giveaway! I love the burnt orange/red color. Teal and the green and navy. Oh man---I think either burnt orange or teal. Thanks for the chance---so generous. The teal and mustard are both lovely!! I love the blue on the right side of the image. Nice! I like the coral and navy best. Do these wash up nicely? I would pick navy! Thank you!! I too love the mustard. I've been dreaming of a mustard-colored skirt for several months now! I love blues, and I am digging the blue on the right. Navy brushed poly is simply perfection. 💙 Thanks for the giveaway! I love the black and the wine color! So many choices, but I would default to black! I love the navy and the soft red. They would go with most of my clothes. I love anything blue! And I love la finch fabrics! I just used the real, so I know it is gorgeous. I love navy though. It looks lush fabric, I think I'd chose the olive green. Your infinity scarf looks fab! I love the aqua mint! One favorite color -- impossible! I love them all! But if i had to choose, navy or olive or white. Thanks! That navy and olive just screams fall!!! But if I had to choose one.... olive... yup olive!!! Olive. No. Teal. No. Navy. ALLLLLL of them! Yes, please! I love it all, but the navy blue, orange and white are lined up so perfectly, my favorite color combination. I love the cards you made from the olive brushed poly! I would make leggings! These sound really nice! I'd pick the burnt orange colour. oh, I can't wait to try this fabric! My fave color is the burnt orange, I want to make leggings to go with a tunic dress. I would get either the mustard or wine color! And I would definitely make a cardigan! How awesome! I love LaFinch Fabrics!! 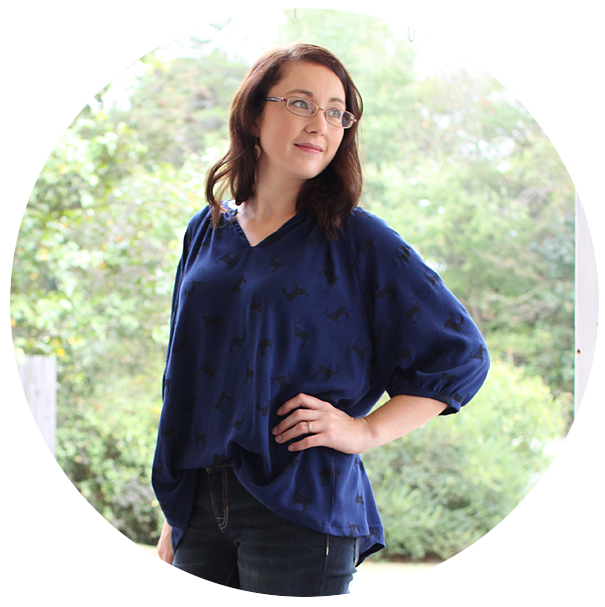 The mustard is my favorite right now and so perfect for fall sewing! I think I got a scrap of one of these in a recent order - so soft! I would choose the navy because I could make a wrapped cardigan and it would match most pieces in my wardrobe! Oooh I love the olive and navy! I like the orange color the most! They are all so pretty but I think my favorite is the burnt orange! So pretty! I think navy is my favorite! The teal is my favorite, but a pair of black leggings would be heavenly. Definitely navy, it goes with everything! Red is my favorite color with orange a close second. I'm having a hard time choosing between the red and the blue....they are all so pretty. I can never have enough navy! The chocolate is lovely. Such a warm fall color for a dress. I love love the burnt orange!! Either the teal (because I love all things turquoise) or the mustard. Great giveaway!!! What an awesome giveaway! Some brushed poly swatches came with my recent order and boy are they soft! I would choose the blush pink. Teal or I love that burnt orange...the checked plaid is awesome, too! Oh I think I'd have to go with Wine, in the fabric too! Black! I wear so much black, it would match everything. But I'm really loving that mustard color too!!! Finch Fabrics is wonderful! Rec'd my first order today! I'd love to try the aqua :-). Mustard! I think it is a wonderful fall color. Although, I would love any of them. LA Finch Fabrics are great! I like the orange and mint! The wine color is my favorite.....but I also love all the other colors! How do you choose just one?! The wine colored would be perfect for the holiday season!! The chocolate brown looks so rich. Thank you for the giveaway. Oo so I love that aqua mint but also dig that olive you used! Oooh- I love the burnt orange... so perfectly fall! I already ordered the teal and it's GORGEOUS in person!!! Love them all, but I'm anxiously awaiting the mustard and wine to be in stock!!! Ooh, love that medium blue on the right! Mustard would be so gorgeous, too!